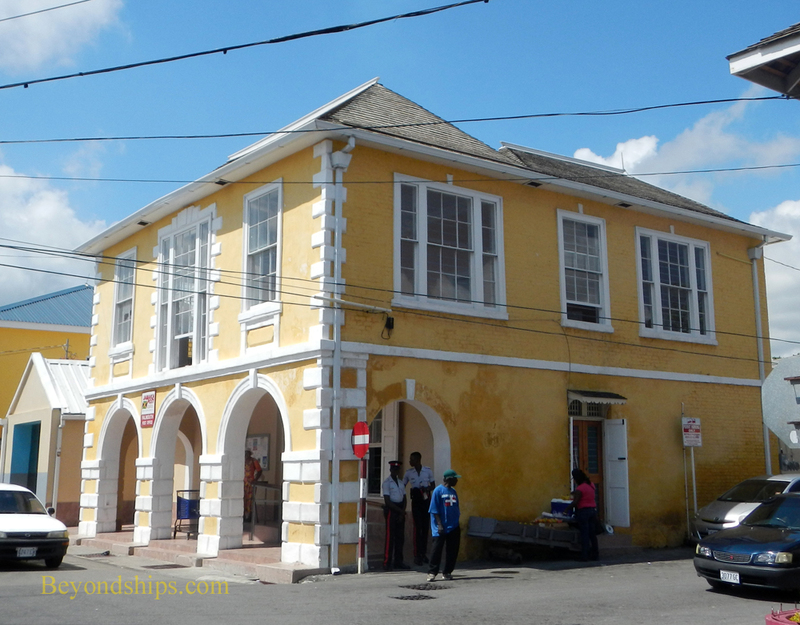 Falmouth was once one of the most prosperous ports in the Caribbean. Many of the buildings from that period still exist. 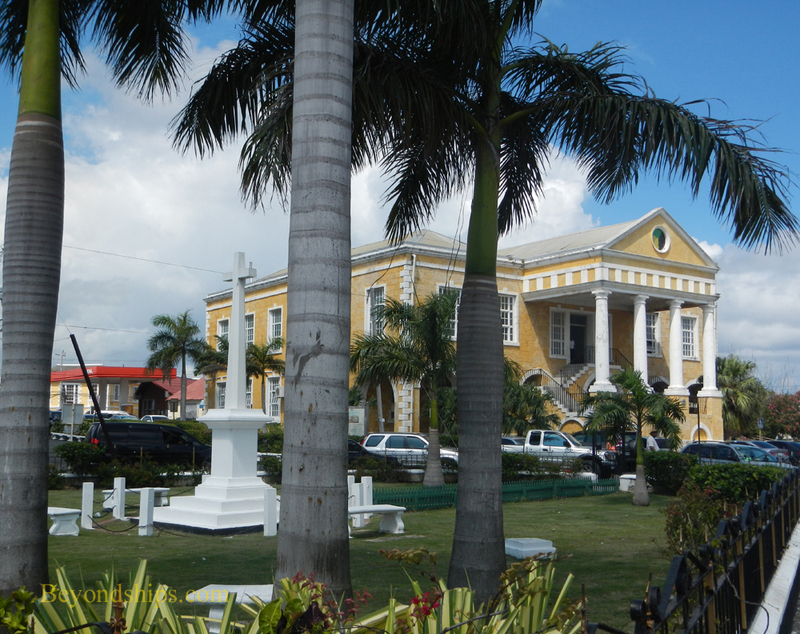 Indeed, you can see the town's old courthouse and the Anglican church from the upper decks of the ships that dock at the cruise port. For people interested in history and architecture, these attractions are quite tempting. Therefore, I signed up for the walking tour of historic Falmouth offered by my cruise ship. 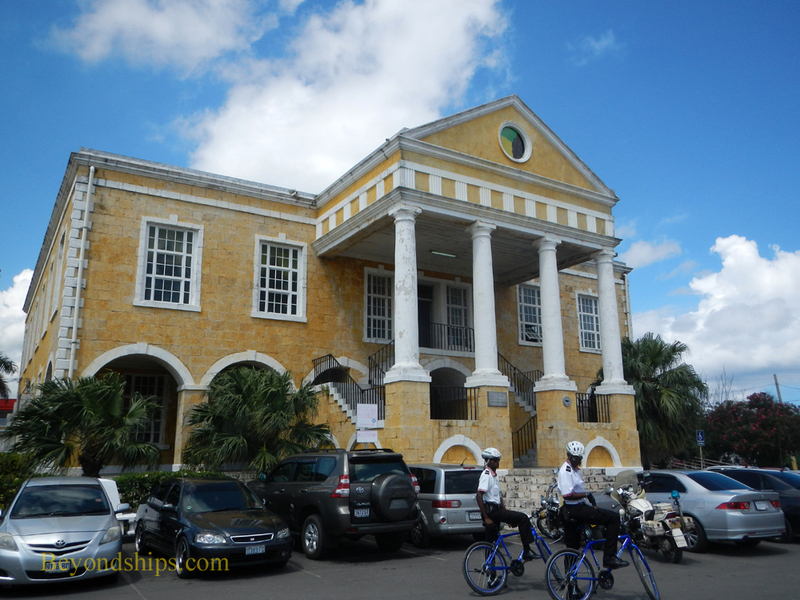 We assembled at the shore excursion meeting point within the Falmouth cruise port complex. Shortly thereafter, a young woman approached the ten or so passengers who were going on the tour. Unlike most shore excursion guides, she was not dressed in casual everyday clothes but rather wore a neat brown uniform complete with a matching wide brimmed hat. She was friendly but it was clear that she took pride in her work and that she did not regard being a guide as more than a means of earning a few extra dollars. 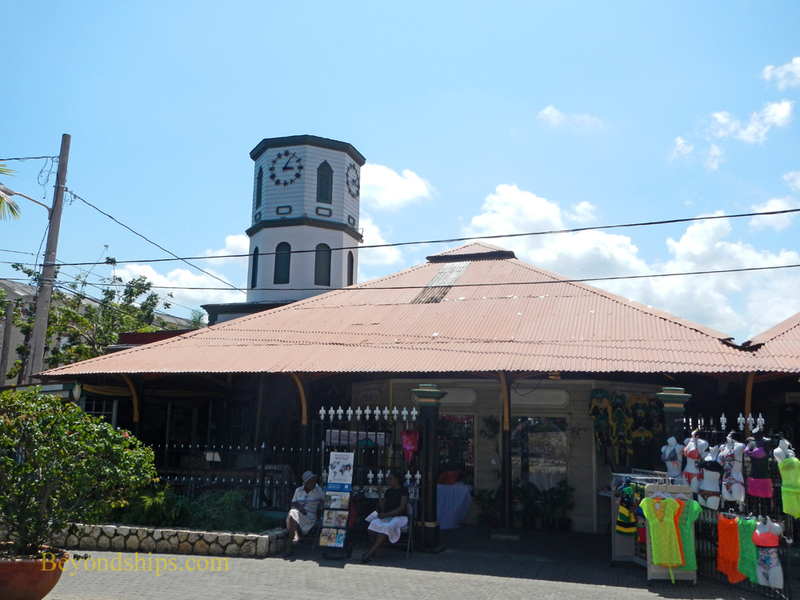 Outside the gate of the cruise complex, local vendors had set up an open air-market. Jamaica has a reputation for aggressive vendors. However, on this occasion no one approached the people on the tour. This was the case throughout the tour. It was not clear whether this was because everyone knew our guide - - many people did seem to know her - - or whether the towns people realize the economic importance of the cruise port and do not want to disrupt one of its tours. During the tour, we saw quite a few examples of colonial Georgian architecture. After slavery was abolished in the first half of the 19th century and the sugar production industry went into decline, Falmouth experienced hard economic times. No new industry emerged so people left and there was little new construction. As a result, the existing buildings were preserved. Over the years, the old buildings were put to new uses. However, the ravages of hurricanes, time, lack of money and neglect have left many in a sad state. Falmouth Heritage Renewal has a program where it is teaching people the skills needed to restore the old buildings. Also, the University of Virginia has a program that is involved with the restoration of the historic buildings. In addition to the history, we had the opportunity to see how the local people live. Falmouth is a town in the developing world, different than towns in North America or Western Europe. The streets are sometimes dusty and goats, dogs and domestic animals run free. 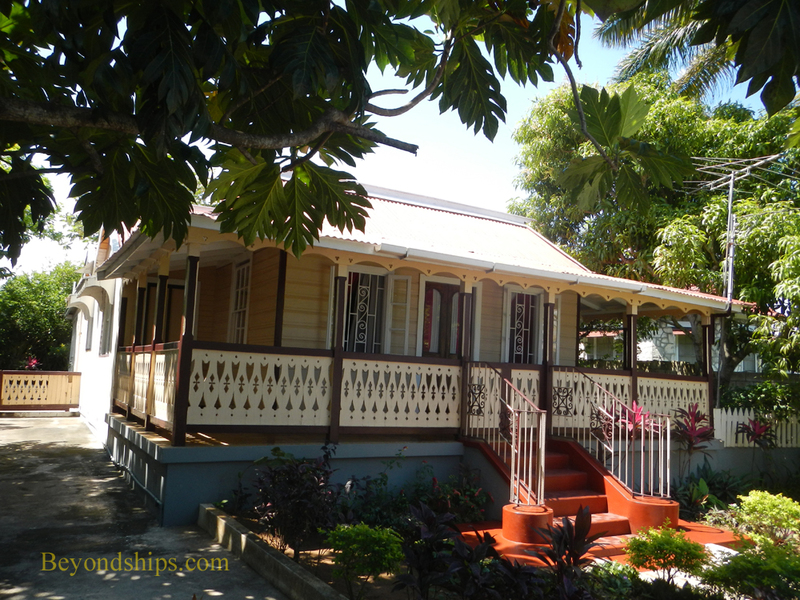 While there were some nicely maintained homes, there were no displays of great wealth. At the same time, we did not any instances of abject poverty. ﻿Above: A street in Falmouth. Below: A nicely maintained home. 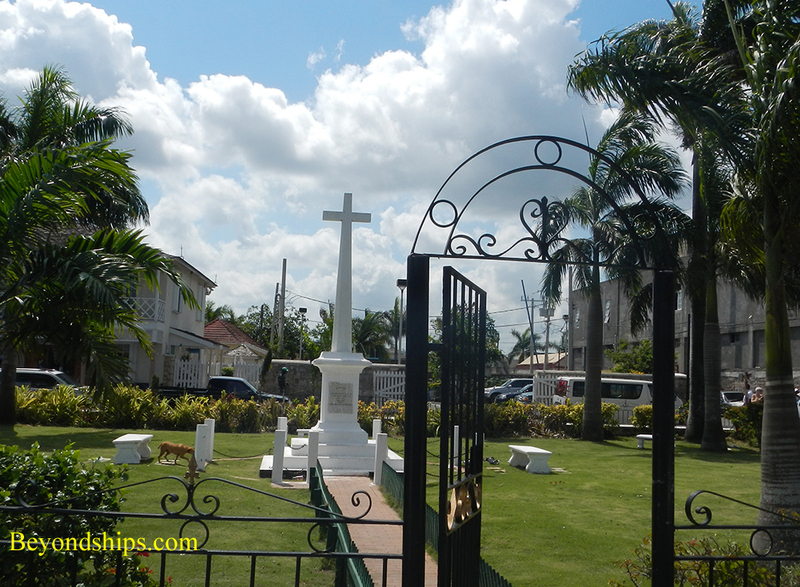 Above: Falmouth's Cenotaph is in memory of Jamaicans who died during the World Wars. Towards the end of the tour, we walked to the ruins of an old fort from which there was a good view of the cruise port. The fort is on the grounds of an elementary school and to get to the ruins, we had to go through an outdoor play area. It was impressive to see the placards placed around the play area with various facts or mathematical equations written on them. The idea apparently being that young eyes seeing these placards as they played may record these building blocks of knowledge for use in later life. The final stop on the tour was a visit inside one of the colonial houses. It was inhabited by an American woman who had lived in Falmouth for some time. She told us the story of the house and what it is like to live in Falmouth today. As mentioned above, I booked this tour in large part to satisfy my curiosity about the architecture I could see from the ship. While it did that, I also felt I learned something about Falmouth and its people. Above left: Falmouth Courthouse is the most visible of Falmouth's landmarks. 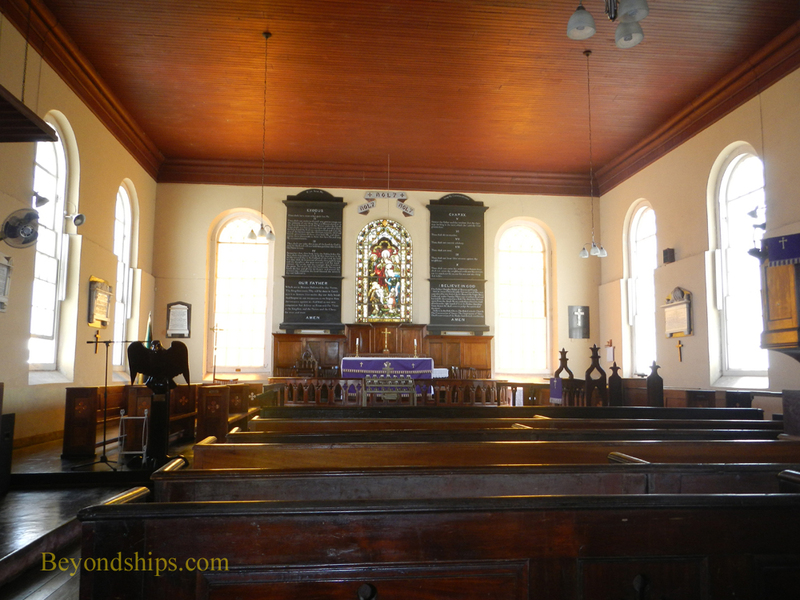 Built in 1817 when Falmouth was at the height of its prosperity, it included a concert hall and a ballroom. Above right: The Falmouth Post Office was built in the 1830s and was originally used as a shop and storehouse. Left: Water Square. 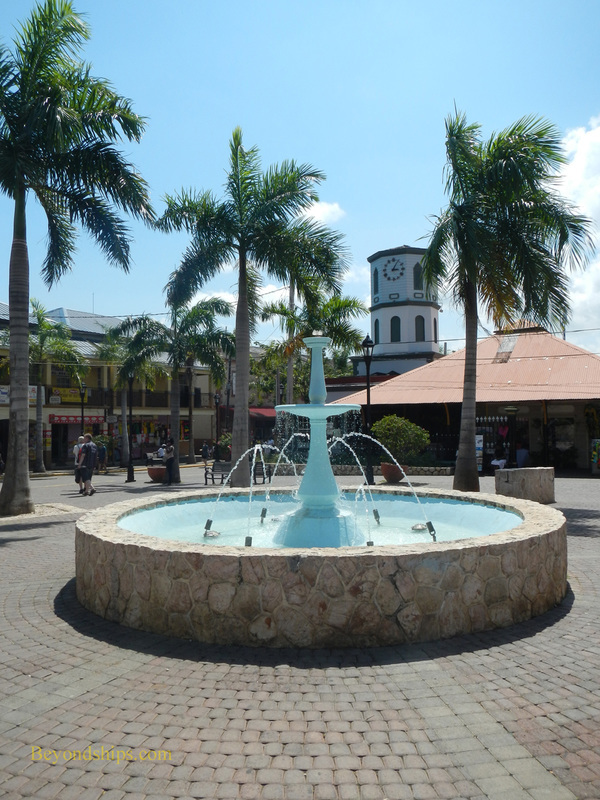 In 1798, Falmouth was the first municipality in the Americas to have piped water. A stone reservoir used to be located here. 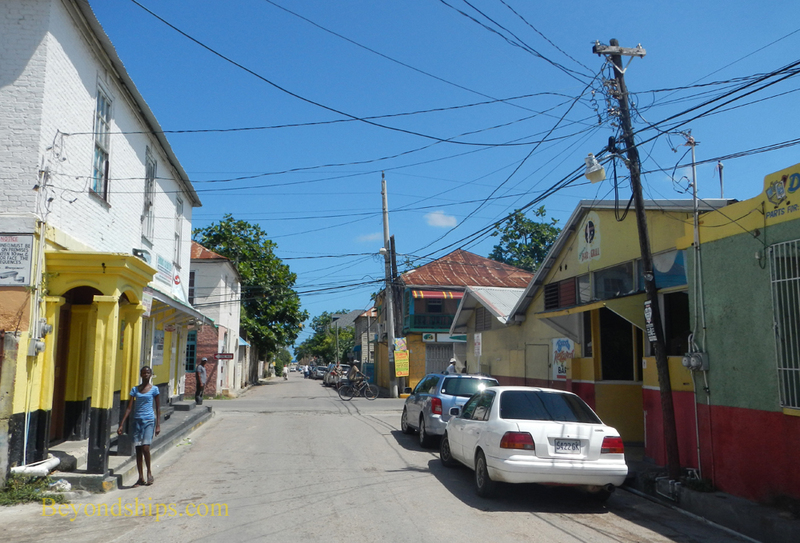 Above: Just off Water Square is the Albert George Market. Built in 1994, it is named after two of Queen Victoria's grandsons. Refurbished in 1989, the market continues to operate. 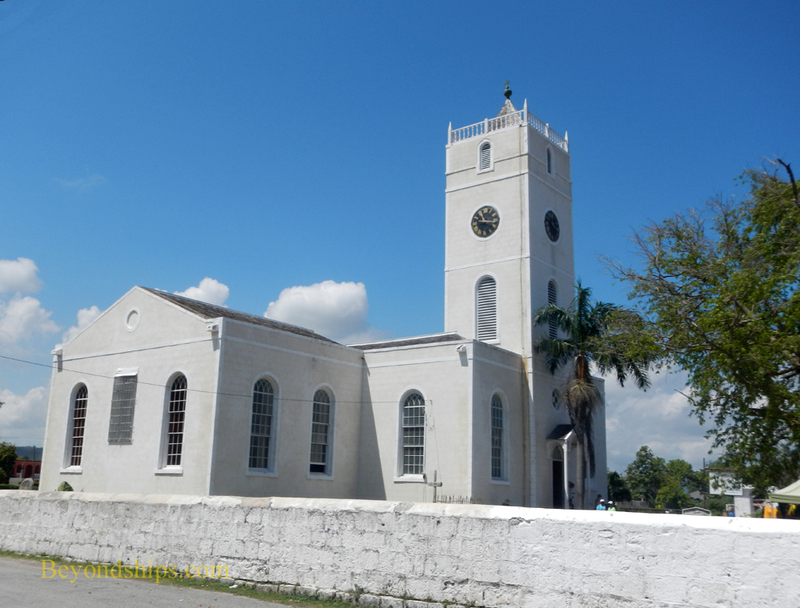 St. Peter's Anglican Church is the oldest public building in Falmouth (1798). 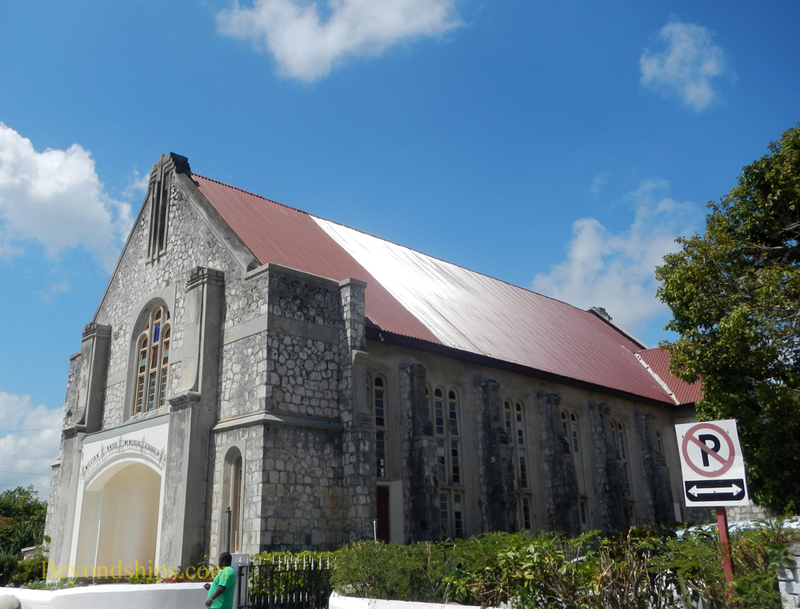 It is also one of the largest churches in Jamaica. Inside, there are stained glass windows. The furniture as well as the supporting pillars are made of Jamaican mahogany. Above left: An example of a chattel house. The emancipated slaves would transport these houses to wherever they were able to find work. Right: The ruins of the Moulton Barrett House, which dated from 1795. 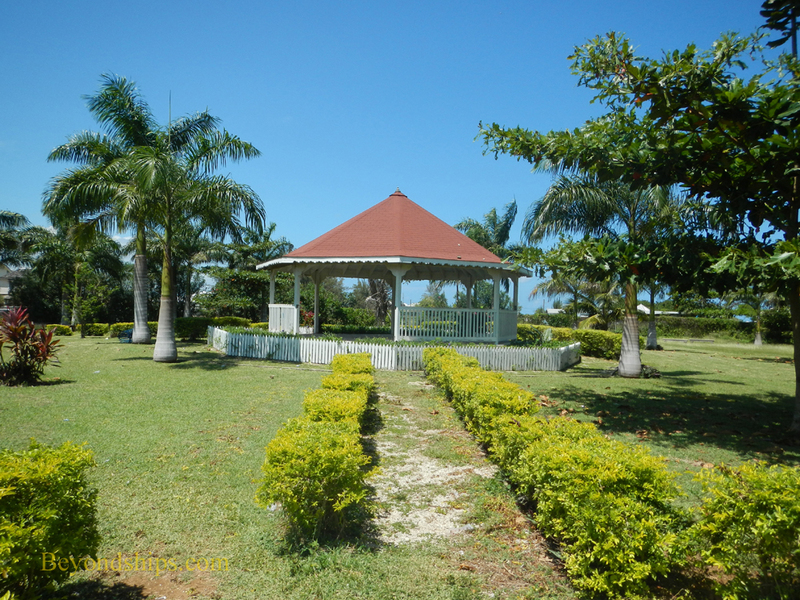 The Barretts were once of the most prestigious families in Jamaica, owning plantations and much of the land on which Falmouth was built. 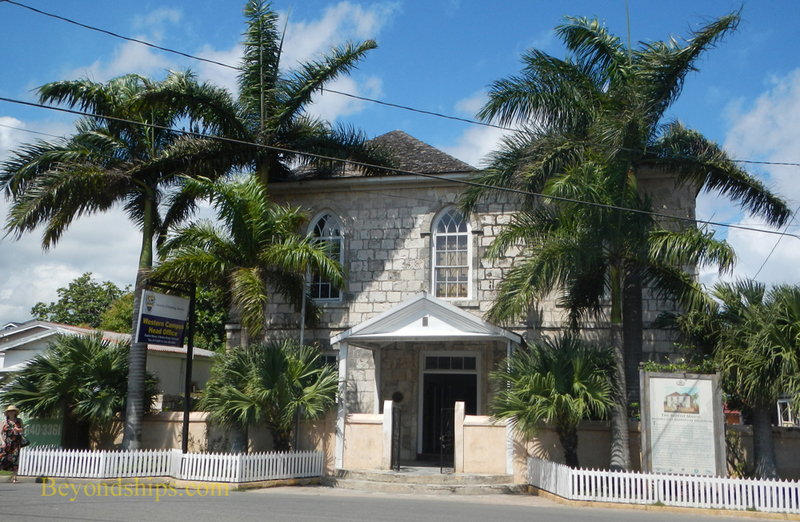 The poet Elizabeth Barrett Browning was a cousin of the Barretts of Jamaica. William Knibb was a Baptist minister who came to Falmouth in the 1830s. A strong abolitionist, he played a leading role in the emancipation of the slaves. 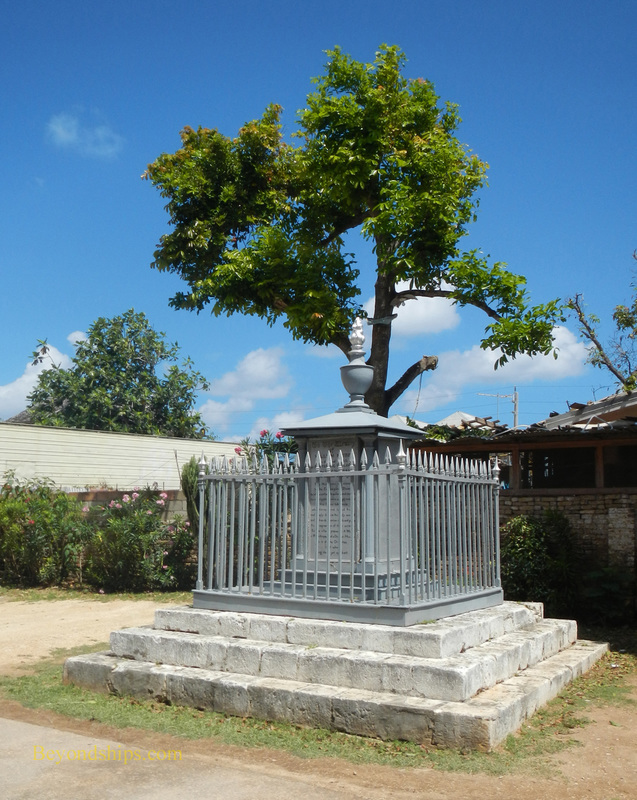 Above left: A memorial to William Knibb. 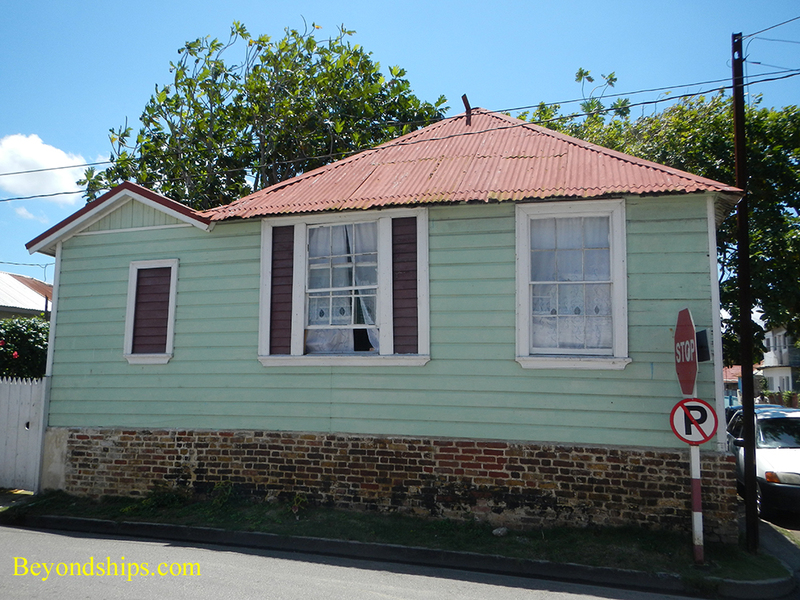 Upper right: The Naptist Manse (1798) was built as the first Masonic temple in Jamaica but was later the home of William Knibb. 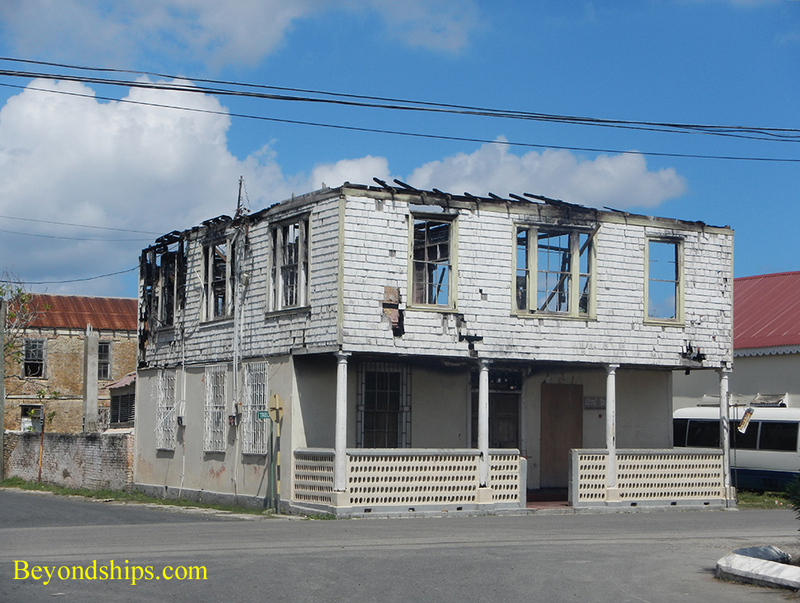 Lower right: The William Knibb Memorial Baptist Church. Above: Victoria Park, slightly worn, but still echoing the mid- 19th century. 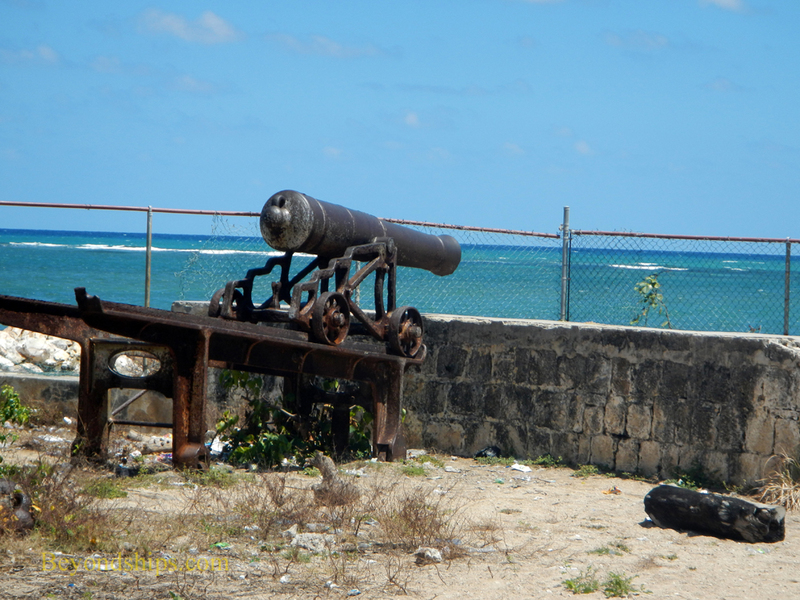 Above right: The ruins of Fort Balcarres at Palmeto Point still has some of its cannons.